While most old Dublin Corporation flat complexes are unadorned brick and uniform, there are a few exceptions. On Lower Kevin Street and off North Strand Road in the city centre, several complexes are illuminated by bands of mosaics set into the outside walls at balcony level. Churches and trains, mountains and lamps, these small, pixellated images have stood out since the flats were first built in the 1960s. There is washing strung up on clothes lines across the balconies of the Kevin Street flats on a recent Monday afternoon. An elderly man pottered on his second-floor balcony. When the flats were built in the 1960s the “Corpo” incorporated the mosaics into the balconies below, the man says. He never notices the mosaic patterns because he’s always on the other side, he says, then laughs and wanders off. 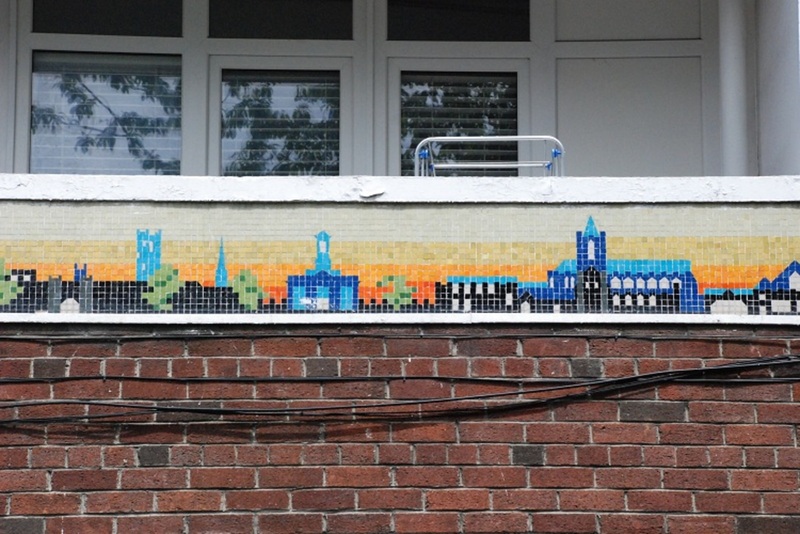 The same mosaic pattern recurs on all three of the three-storey blocks of the flats that stretch from the corner of Bride Street up Kevin Street Lower. There is Christ Church Cathedral, and St Patrick’s Cathedral, and what appears to be St Stephen’s Church, otherwise known as the Pepper Canister. The next panel of mosaics is a series of blue mountains. Produced in bright colours, they’ve worn well. 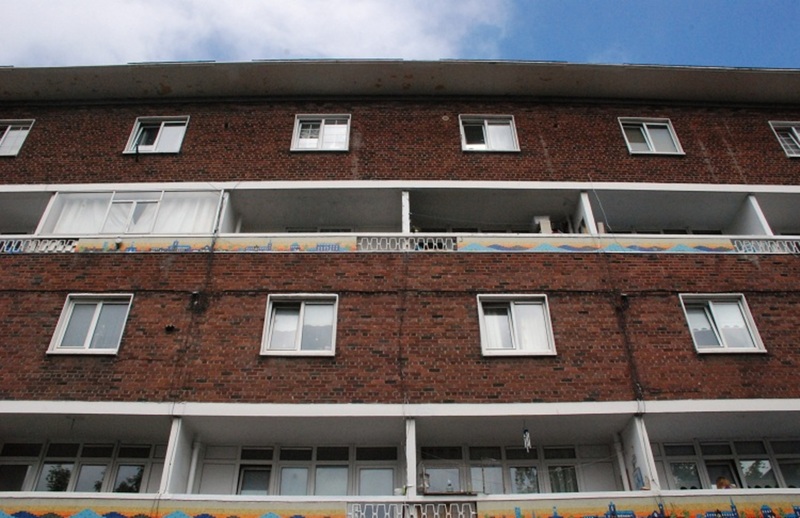 The Kevin Street flats are similar to other complexes around the city, a standard design with “butterfly” or “gull-wing” roofing and similar windows. But only one other complex has such detailed design work in the form of mosaics. Across the city near North Strand Road, the balconies of the three flat complexes are also bedecked in bright mosaic tiles. At North Great Clarence Street, the first block of flats features several buoys, boats, and lighthouses. 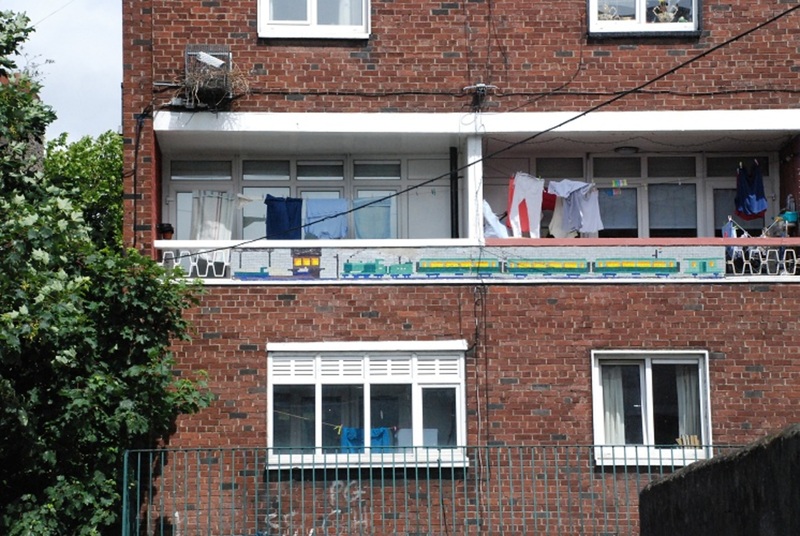 The second block of flats at North William Street features a recurring pattern of five lamps – the Five Lamps, presumably, which are nearby – while up from these, at Charleville Mall, a green train, lit from within by yellow tiles, pulls into a station. 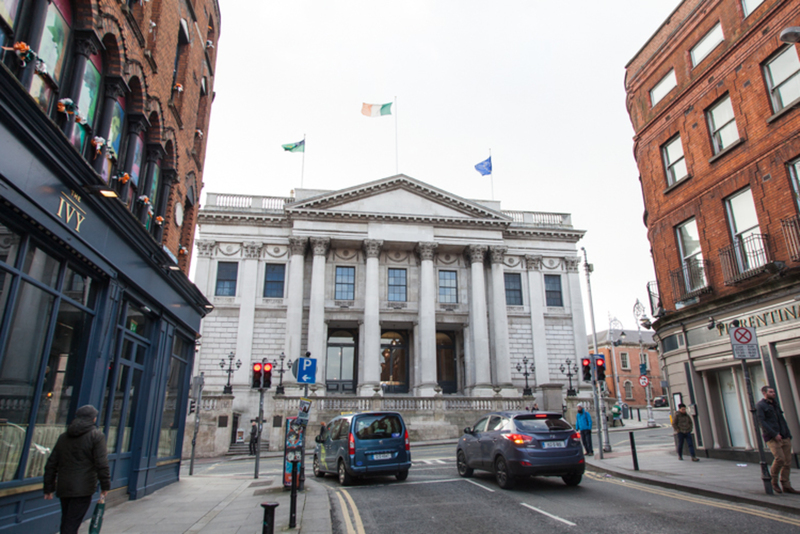 Dublin City Council’s Heritage Office has “looked at the ones in the Charleville Mall gull-wing flat blocks,” said a Dublin City Council Heritage Officer, in an email, sent via the press office. “The mosaic frieze panels here naively reference the scheme’s local landmarks,” they said. There are Connolly Station references in the railways, Dublin Port in the boats, and the Five Lamps in the lamps. According to the heritage officer, the mosaics, like the Charleville Mall flat complex, were designed by Daithí Hanly, the city architect from 1959 to 1965. It’s unclear whether he did the Kevin Street ones, too. Unfortunately, they “don’t have information on who actually created the mosaics,” they said. 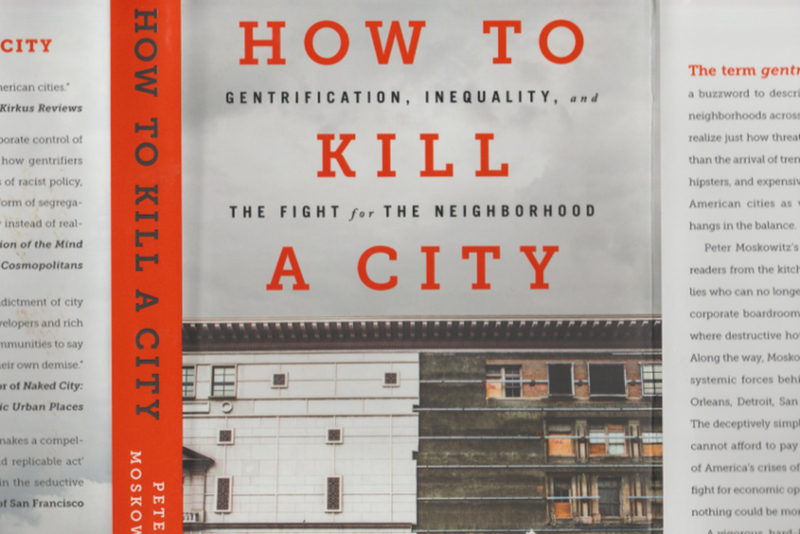 “The other examples of the blocks elsewhere in the city make site-specific reference to local landmarks,” they said. Hanly was appointed Corporation Housing Architect in April 1956, according to the Irish Dictionary of Architects. There are no specific details relating to the mosaics here or in the records for council flats from the period, however. It is clear, at least, that Hanly was responsible for the mosaic’s inclusion in the old corporation flats, even if the artist or artists themselves remain unknown. But for architect Shane O’Toole, the mention of the mosaics prompted recollection of a conversation he had 35 years ago with architect Liam Boyle. Boyle went to work at O’Toole’s father’s office, Lynch O’Toole Walsh in Rathfarnham, after his architectural partner, Seamus Delaney died in 1980, according to Shane O’Toole. 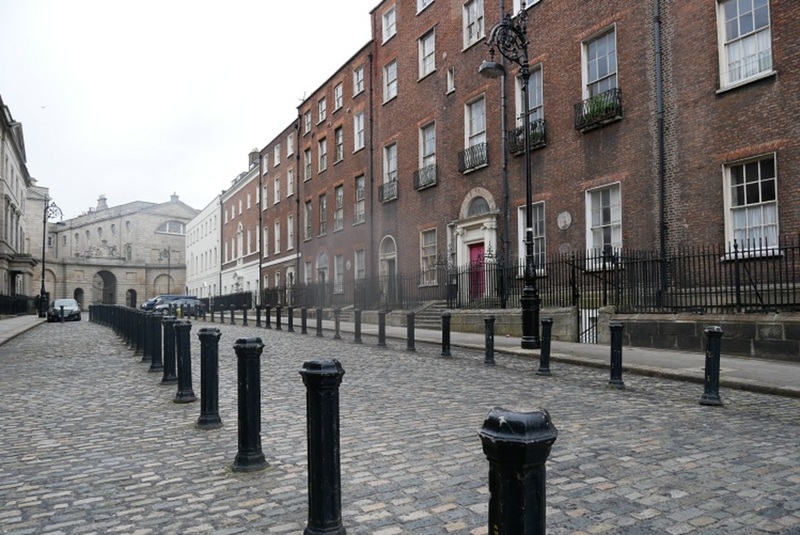 Delaney and Boyle first met at the Dublin Corporation – as it was known then – with Boyle having previously worked for architect Michael Scott’s office, he said, by email. Interestingly, says O’Toole, Boyle’s last building with Michael Scott Architects was Busáras, which was completed in 1953. His first build after he left the Corporation was the Sugar Company HQ in Earlsfort Terrace. Both buildings make extensive use of of external mosaics, said O’Toole. O’Toole says Boyle and Delaney worked on corporation flats together. He thinks – or seems to remember – he was told by Boyle that the mosaics were designed in-house at the corporation, to “bring a little joy and individuality to the houses, especially for the children,” said O’Toole. “I could be off the wall with this and conflating half-memories. A large grain of salt is needed,” he said. O’Toole says these are “only the happy memory of chats with an old architect I once knew, who was a fine, caring man and a good designer”. Thanks Cónal - Often wondered about them. It's funny how the mosaics' late 50s design echos Craig Robinson's wifi icons which appeared around Dublin in 2013. 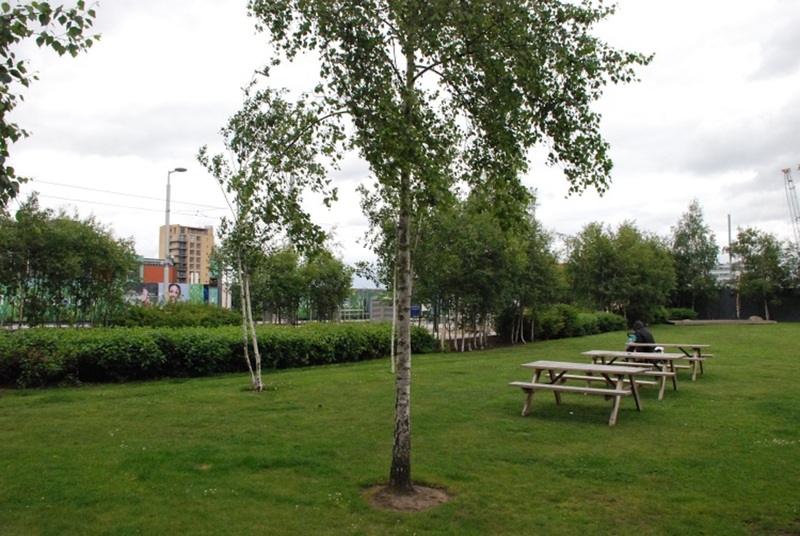 A more famous example of Daithí Hanly's visual flair is the Garden of Remembrance he designed with sculptor Oisin Kelly.